Meet Trax, Chevrolet’s first subcompact crossover. There’s no question that small crossovers are big business. Not only is the compact SUV class the second most popular in the industry next to midsize cars, but it’s the fastest growing—in both sales and number of entries. And some new entries coming down the pipeline are what might be referred to as “subcompact” crossovers. And that’s the game Chevy is entering with the new Trax. Based on the Buick Encore that debuted for 2013 (which in turn was based on a global platform introduced a bit earlier), the Trax slots in below the Equinox, which in some cases (including Consumer Guide’s) is considered a midsize SUV. As such, Chevy has been without an entry in the compact class—seemingly an odd oversight such a prominent brand. Size-wise, Trax is about 10 inches shorter and 2 inches narrower than the popular Ford Escape. For those driving in an urban environment, that’s a plus. Predictably, we found the Trax to be very maneuverable, thanks not only to its tidy dimensions, but also to a turning circle that’s 2 feet tighter than that of the Escape. 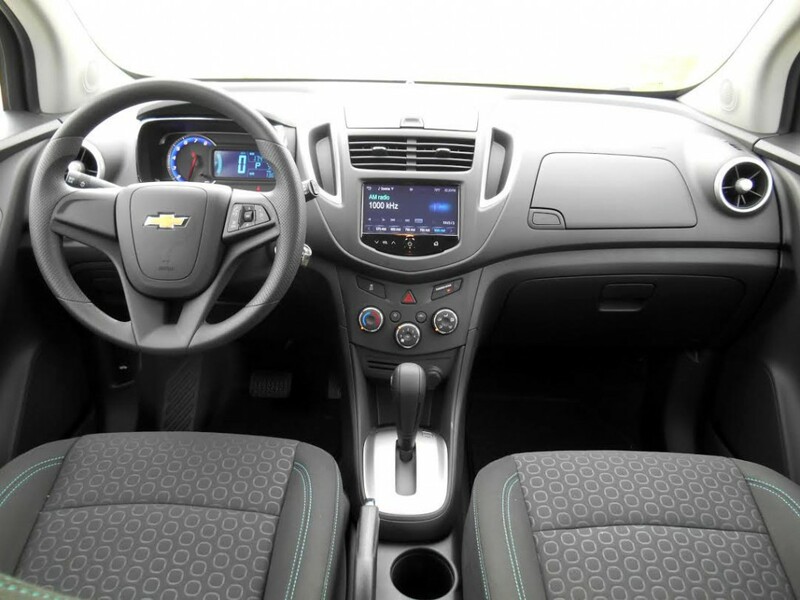 Despite its tidy exterior dimensions, Trax boasts ample front-seat space. An LS model is shown here. Although its smaller size would imply that the Trax is short on passenger and cargo space, that’s not the case. 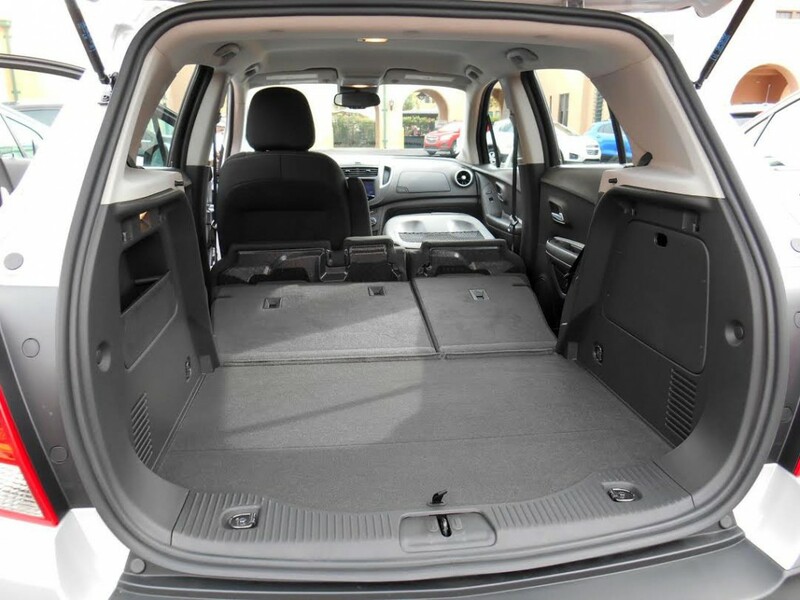 There’s plenty of head and leg room front and rear for full-size adults, and some clever packaging leaves a fair amount of useful cargo room. Although folding the rear seat backs is a multi-step process (lower the rear headrests, flip the seat cushions forward, fold the seat backs), doing so creates a nearly flat and level load floor. Furthermore, the front seat back can also be folded flat, resulting in a long channel that can accommodate 8-foot lengths. There’s also some under-floor storage in back along with a small side pocket. 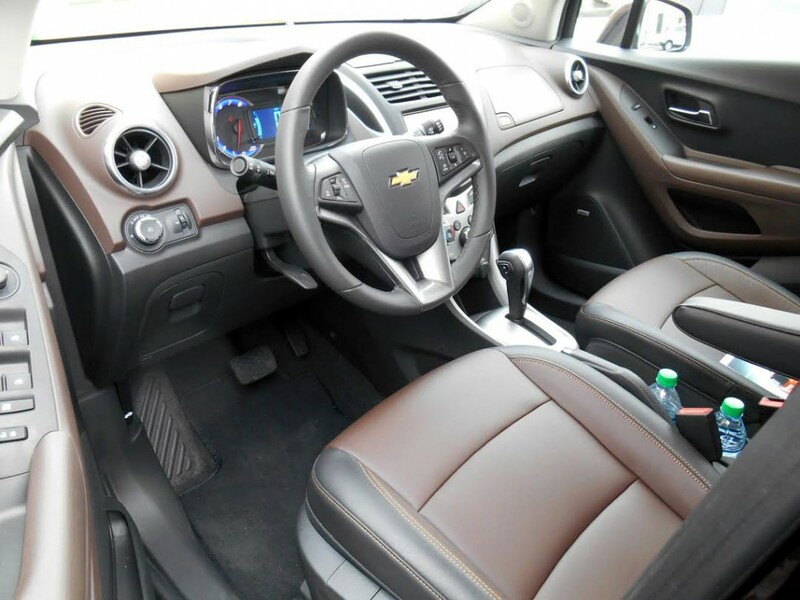 Trax LTZ models enjoy decidedly spiffier interior trappings. Impressive as that is, it pales next to the interior storage space. Chevrolet claims there are 15 “clever and convenient storage areas.” We’re not sure what’s included in that total, but we can say that within reach of the driver are (deep breath) a large lower glovebox, a small upper one with Aux and USB plugs, a covered dashtop bin, twin vertical bins flanking the audio/climate controls (great for sunglasses), a forward console bin with 12-volt plug, four console cupholders, a flip-out left-side dash bin, small bins beneath the door armrests, and the expected map pockets below. Furthermore, all but the door bins have cushioned bottoms to help prevent stuff from rattling. The only oversight is the lack of a center console, though that may be due to space limitations in the narrow cabin. By contrast, visibility is just … okay. Front and side roof pillars are of moderate width, so they don’t block a lot, but the rear pillars are quite thick; thankfully, a rearview camera is standard. Underway, the aforementioned retractable rear headrests really help unclutter the view straight back. However, when rotated to the sides, the sun visors don’t extend to fully cover the side windows, a rather odd omission. 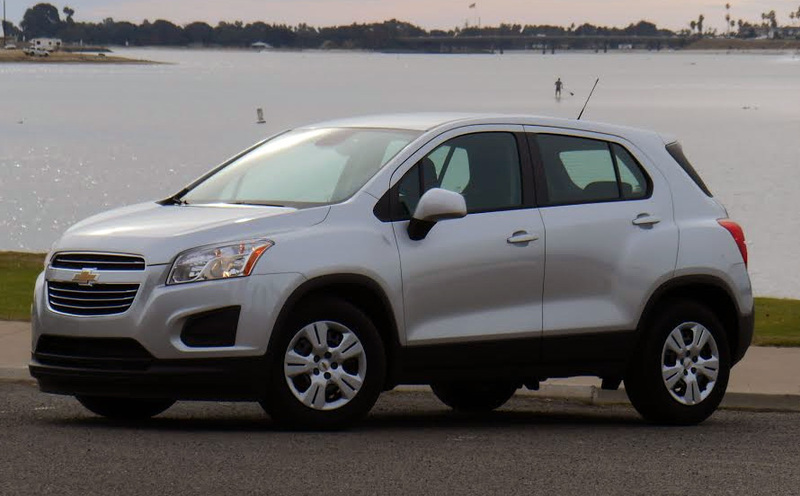 Trax borrows its muscle from the similar Buick Encore. 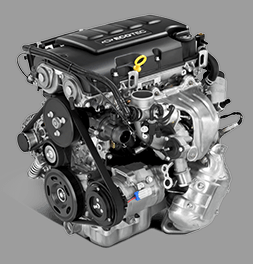 The turbocharged 1.4-liter engine produces 138 horsepower. Audio and climate controls are quite handy and easy to use. Chevrolet’s MyLink infotainment system with 7-inch touchscreen is standard, and it’s simple enough to adjust. Also standard is OnStar assistance system with 4G LTE WiFi hotspot, but—in a sign of the times—not a CD player. Available features include Siri Eyes Free for voice commands and Chevy’s BrinGo navigation, the latter of which replaces an expensive navigation system with a low-cost app that allows you to use your cell phone’s navigation capabilities through the car’s screen and controls. Climate is adjusted using three simple rotary knobs—a somewhat “old fashioned” but highly practical layout we wish more cars employed. Like the Buick Encore, the only powertrain offered on the Trax is a 138-horsepower 1.4-liter turbocharged 4-cylinder engine mated to a 6-speed automatic transmission. Front-wheel drive is standard, but all-wheel drive is available as a reasonable $1500 option. While this combination offers adequate acceleration, it suffers the usual “turbo lag” both from a stop and when stabbing the throttle at speed; in both cases, it takes a beat before power comes on strongly. The upside is that the small engine provides impressive EPA fuel-economy ratings: 26 city/34 highway with front-wheel drive, roughly 2-3 mpg less with all-wheel drive. 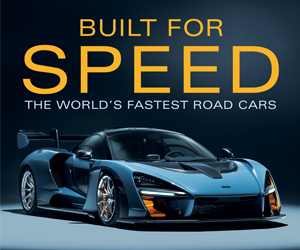 Combined with a 14-gallon fuel tank, that makes for a hypothetical freeway cruising range of well over 400 miles either way. Folding the seatbacks creates a nearly flat load floor. We drove two versions of the Trax: a base front-drive LS and a top-line all-wheel-drive LTZ. Between them is the LT, which is expected to be the most popular model. The LS rode quite well—at least over what count as “bumps” on San Diego roads (imperfections that are laughably minor by Chicago standards)—but the LTZ was somewhat stiffer. According to Chevrolet, that’s strictly due to tire choice; the LS has 16-inchers on steel wheels, while the LTZ rides on lower-profile 18s on allow wheels. (The mid-line LT uses 16s on alloy wheels.) In return, the LTZ has a bit quicker steering response, but we’re not sure that’s a good tradeoff for most drivers. At least in base form, a major point in the Trax’s favor is its value equation. The front-drive LS starts at about $21,000 with destination. That price includes not only the aforementioned automatic transmission, but also air conditioning, power windows and mirrors, and remote power locks. It also includes some unexpected niceties such as a compass, Bluetooth wireless cell-phone link, and driver-seat power lumbar adjustment. On the safety front, Trax impresses with 10 standard air bags, including unusual-for-the-class rear-side airbags. Although direct rivals are currently few—mainly the Mitsubishi Outlander Sport, Nissan Juke, and the Trax’s Buick Encore cousin—the competition is about to heat up. Headed this way are the Fiat 500X, Honda HR-V, Jeep Renegade, and Mazda CX-3, all of which are expected reasonably soon. While there are areas where those newcomers may well excel, the Trax has set a high bar for value and cargo versatility that will be tough for these pint-size competitors to clear. Written by: Rick Cotta on December 5, 2014.on March 22, 2019.